No problem getting the themes loaded, however, I’m new to using child themes. I activated the Boss theme first and then I activated the Social Leaner theme. After doing that, it appeared that the link to activate the Boss Parent theme was again an option. Is this normal? Hi, I’m really excited to shift over to your theme (including your Social Learner with LearnDash). But when I activate your theme, changing from my already developed site that uses the GovPress theme along with the membership plugin ThemeMyLogin, no profile and admin access appears. In fact, no menu on the right appears. Any ideas? I think that is exactly what you were looking for. We are also working on a one click install that should be ready near the end of Q1 2016. Please check this tutorial link to use one click installer, if you need xml file please contact from our contact page our team will send you demo xml file. After register of user on my page the user has a information about e-mail, which has been sent to his mailbox. I tested it, but i haven’t received any e-mail. Can you help me ? Hi Kuba, sending email is server specific property, You can use https://wordpress.org/plugins/wp-mail-smtp/ plugin. If you still have any issues, Please create a ticket and our support team will help you on it. 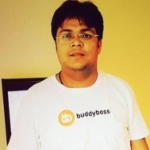 Hi Adnan, You can download BuddyBoss-one-click from my account section, if you have any issue to download it, Please create a ticket and our support agent will attach with the response. Hi. I am not sure what I am doing wrong. I have followed your instructions (with my existing site) and when I activate the child theme and view the site it has every menu and menu option in plain text down the left-hand side of the site. There is some semblance of the theme colours right at the very bottom of a very long page. Disregard. It was a problem at my end. Now fixed. Glad it resolved, you can contact our support agents after login to BuddyBoss.com and create a new ticket form my-account page.